Let us help you realize the gratification that can only come from full bookshelves! 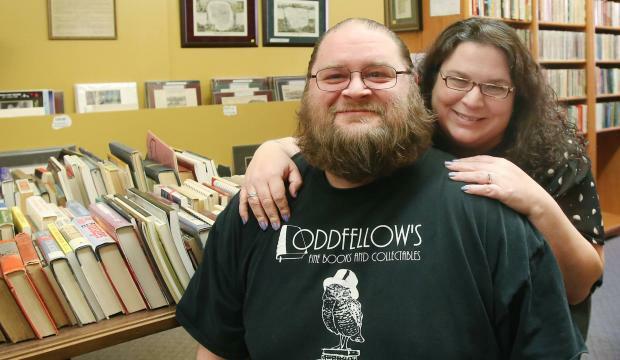 Oddfellow's is owned and operated by Brandon and Martie Rison, local history buffs with a passion for books. The Rison's, both from northeast Kansas, host multiple Kansas history forums online. The most popular of these groups is the Topeka History Geeks which highlights Topeka's past. Collectors themselves, the Risons have spent years building on their knowledge of antiquarian books. They are members of the Independent Online Booksellers Association and Brandon is a graduate of the Colorado Antiquarian Book Seminar. They are both writers and contribute to local publications. They regularly give presentations on collecting, social media use, and a variety of other related topics for local clubs and organizations. But most of all, they spend a lot of time with their books. We pride ourselves in honest and accurate descriptions of the antiquarian books that we offer. Oddfellow's is sure to have the book you're looking for, don't see what you are looking for online? Call us at (785) 235-1181 or send us an email and we will search our off-line inventory for you.